Through a combination of particulate-level representations and virtual lab activities, students learn how gravimetric analysis can be used to determine the concentration of various species in water. They then use this knowledge to test for sulfates in drinking water. 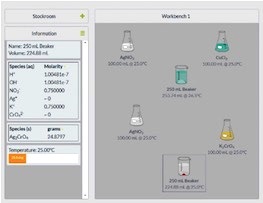 Students use the virtual lab to determine which reactions form precipitates, balance chemical equations, and carry out inquiry to evaluate the concentration of sulfates in water.